I think most of us know (and love) traditional Puppy Chow ("Muddy Buddies"). I've made several versions of the original throughout the years. Since we are in the middle of summer (and lots of hot temps) right now, I was pondering trying a more "refreshing" version. The flavor of lemon immediately came to mind. Using a lemon cake mix makes this recipe so super simple. 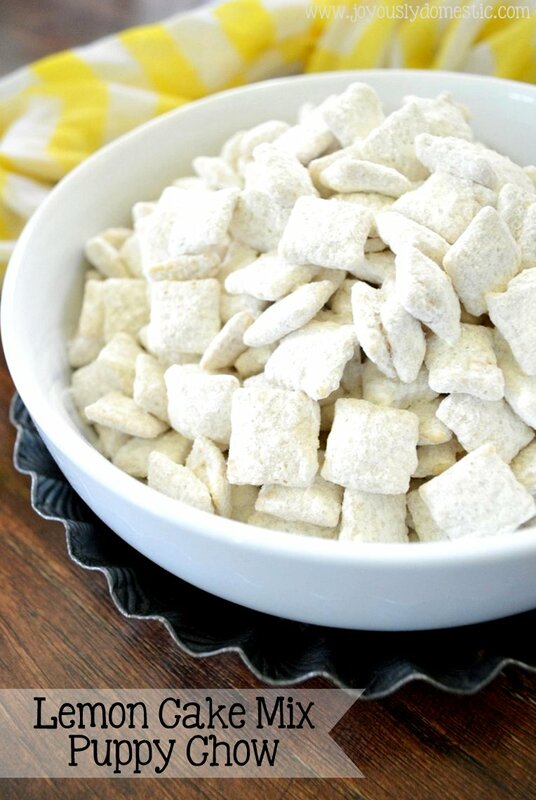 In just a matter of like, five minutes you can be enjoying this addicting, sweet Lemon Cake Mix Puppy Chow. Pour cereal into a large container or mixing bowl. Set aside. Pour powdered sugar and cake mix into a large zip-top bag. Seal and shake to combine. Open bag. Set aside. Immediately drizzle melted chocolate over cereal. Carefully stir to evenly coat cereal. Working quickly, transfer coated cereal to the bag of cake mix/sugar. Seal. Shake bag gently until all cereal is well-coated. Serve immediately or keep stored in an airtight container/baggie. NOTE: The lemon flavor is definitely present, but is somewhat subtle in this version. For a more robust lemon flavor, you can add in a few drops of lemon extract to the melted chocolate before coating cereal.